My family could be considered connoisseurs of Hendricks County parks, as we have explored just about all of them many times over. Everyone picks an activity of interest, and we find a park to appease all of us. Last week on a very hot, humid day the kiddos&apos; consensus was a playground, splash pad and creek. I was interested in scenic creek views and trails. 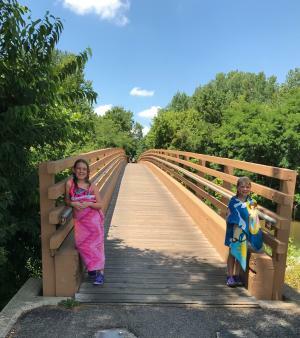 We made a decision, packed a lunch and headed for a fun afternoon at Guilford Township&apos;s Hummel Park, located at 1500 Center St. in Plainfield, Indiana. Hummel Park offers numerous activities and amenities for all ages throughout its 205 acres! This Guilford Township park boasts an area where, "natural beauty and recreation come together." Just one visit and you will certainly agree. Not only does the park provide scenic views and recreational areas but also offers performances at the amphitheater. White Lick Creek flows through the middle of the park creating east and west ends. A 310-foot wooden bridge connects the ends and provides picturesque views of the creek! Click here for a park map. There are so many reasons to visit Hummel Park! Here&apos;s a list of 9 of my favorite amenities on the eastern portion of the park. 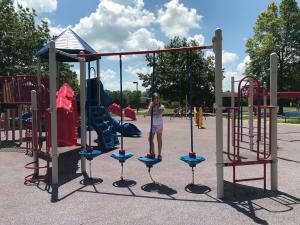 This popular playground has tons of fun features, such as, ladders, slides, bridges and swings. It&apos;s spacious, so even when lots of kids are playing, it never seems over crowded. A toddler/pre-school area is separate from the larger equipment. It&apos;s easy for little ones to maneuver and the features are smaller. A shelter house and shaded picnic tables are located near this playground. Enjoy a picnic with beautiful surroundings. Another small playground designed for children 5-12 is located along Blue Heron Path. It&apos;s a quick walk from Red Maple Path bridge. The equipment consists of bridges, ladders and slides. My kids are usually the only ones playing on it as I think many visitors are unaware of this hidden gem. Since it&apos;s near a creek access point, we utilize the playground before and after our time spent down by the creek. 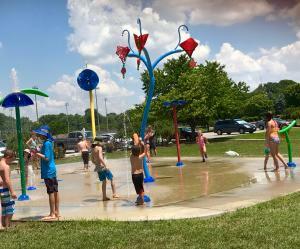 Considering the heat index the day of our visit, it&apos;s no surprise the splash pad was the popular spot. My plan was for my kids to run around the playground and then cool off at the splash pad. Several other families had the same idea. Kids love the water features as they are constantly being sprayed. Also, the large containers dumping water is always a hit! A few tables with large umbrellas and trees surrounding the pad provide some shade. It is appropriate for children 12 and under and open daily from 11 a.m.-7 p.m. during summer months. Hummel Park provides numerous spaces for recreational sports players. Three baseball/softball diamonds are located in the northeast corner of the park. To the west of them are basketball and volleyball courts, a soccer field and a disc golf course. Encompassing the east end of the park is Red Maple Path, a 1.1-mile track with tenth mile markers. Shelter houses and gazebos can be found throughout the park and are available for a variety of events. Picnic tables and charcoal grills are available and most offer electrical service. Click here for more details. The Guilford Township Community Center is also available to rent for large indoor banquets. As mentioned earlier, the Red Maple Path wooden bridge joins the east and west ends of the park. It&apos;s easy to find as it&apos;s centrally located near the splash pad and restrooms. As you cross it, take time to enjoy the creek views on both sides. Walkers, runners, bicyclists...all are welcome to utilize Hummel Park&apos;s nature trails. Scenery includes wooded areas, White Lick Creek, lakes and wildlife. Two trails begin once you cross the Red Maple Path bridge. The half-mile Cottonwood Path extends to the north and the two-mile Blue Heron Path meanders to the south. The Blue Heron Path runs parallel to White Lick Creek and eventually leads to Blue Heron Lake. Check out this previous post with more in-depth details. The Blue Heron Path is part of the White Lick Creek Trail system which also connects to Plainfield&apos;s trail system. It is great for covering long distances while enjoying Plainfield&apos;s beauty and landmarks. This is one of my family&apos;s favorite features of Hummel Park. The kids love wading in the water, looking for fish and finding rocks. My husband and I enjoy those activities as well, but also appreciate the attractive landscape and crystal clear water! It&apos;s easy to find hangout spots along the creek as there are several access points off Blue Heron Path. We use the access point closest to the playground, which leads to a large sandy area and you can see some neat rock formations in the water. Be sure to wear water shoes if you plan on wading in the creek! Hummel Park offers five fishing lakes on its south end, the largest being Blue Heron. I always see at least a few people fishing in various lake locations, so they must be catching fish often. Types of fish usually caught include catfish, bass and blue gill. Sounds like a relaxing way to spend time with family or friends. The Hummel Park Performing Arts Center amphitheater, 5373 S. County Road 700 East, adds a unique element to Hummel Park that sets it apart from other parks. The lawn seats 1,500 people allowing for large community events! 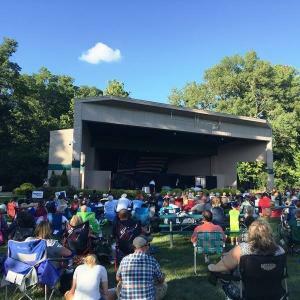 They host a free, family-friendly summer concert series on various Saturdays. Check out the musical groups and specific dates here. Play&apos;nfield In The Park Performing Arts Festival is a local favorite which is also a free, family-friendly event. Every Fourth of July, music is performed in the evening until the conclusion of the fireworks as part of the annual Fireworks Extravaganza. This huge hill is ideal for those who love sledding! Bundle up the kiddos on those snowy days and join in the winter fun! Hummel Park is an ideal place to bring family and friends for a fun day. Beauty and recreation coming together provides features for everyone to enjoy.